The holiday group (from left) Christopher, Patricia, Rose, Cynthia and Edward. The colour palette of pink/grey/khaki/blue is evident here on a desultory picnic trip. 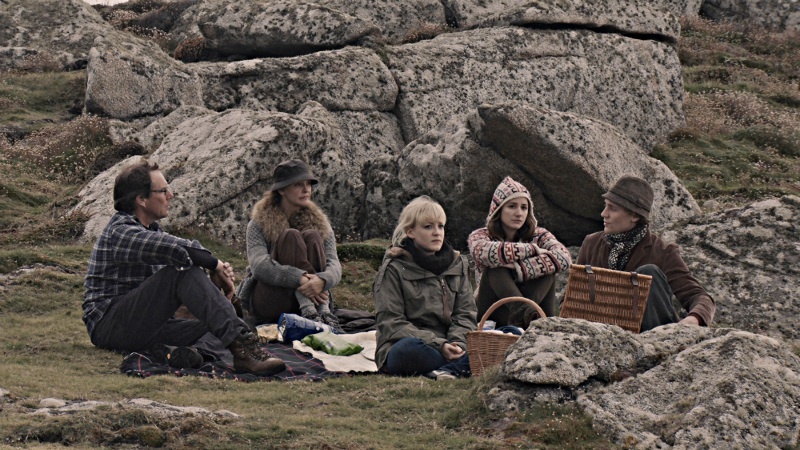 This is the second film by writer-director Joanna Hogg and like the first, Unrelated (2007), it features an upper middle class English family on holiday. I confess that I really didn’t like the earlier film set in Tuscany. I admired it as a piece of filmmaking but most of the characters were so unappealing to me that I found it hard to watch. In particular I found the central character, a woman on her own joining a family group, to be intensely irritating. Because of this I approached Archipelago with some trepidation. This time the family group is much smaller and the narrative seems more focused. The holiday on Tresco, one of the Scilly Isles, is a family tradition. They always stay in the same house and this time the holiday is a kind of farewell gathering for Edward (Tom Hiddleston), who has given up his city job in order to take up a voluntary post in Africa working on an AIDS project. He’s joined by his older sister and his mother. His father is supposed to be there but hasn’t as yet arrived. There are two ‘outsiders’ in the party. The first is Christopher, a professional artist who is tutoring Edward’s mother (and who is played by Hogg’s own art tutor, the painter Christopher Baker). The second is a live-in young cook, Rose, played by Amy Lloyd who is a professional cook with a drama school background. The mother (Patricia) and sister (Cynthia) are played by professional actors (Kate Fahy and Lydia Leonard). Joanna Hogg has explained that there were two specific inspirations for her script. One was Dostoevsky’s novel The Idiot and the other was a Paul Schrader article about Robert Bresson’s Au Hasard Balthazar (France 1966). Edward is effectively the man who is too ‘good’ for his own good and he finds himself in a family situation where although he is clearly troubled by his own indecisiveness, it is very difficult to communicate with his sister or mother – in fact he’s much more likely to have some form of communication with the two outsiders. So, what does Joanna Hogg achieve in Archipelago? If you want a conventional art cinema review of the film, I highly recommend Jonathan Romney in Sight and Sound (March 2011). He nails the film very convincingly. I’m interested here in some other questions which I’m struggling to articulate. First I should say that as an ‘art object’, I think that Archipelago is very well put together. Every aspect of the film has been thought through carefully and executed with precision. There is a clear personal aesthetic which covers camerawork, editing and sound as well as narrative structure. This enables Hogg to present the landscape of Tresco – or rather the ‘environment’ of the island – as almost another character in the drama. There is no music in the film but the soundtrack is filled with the sound of the wind (which is of Kurosawa-like intensity at times) and birdsong. On the DVD commentary Hogg tells us that the birdsong is in effect an ironic commentary on the characters’ lack of communication with each other. The camera rarely gets close to any of the characters, preferring a discreet distance and often framing the three family members together in awkward (but often quite beautiful) compositions. There is much discussion about the philosophy of painting and art generally and several scenes are shot in a painterly style. Romney refers to a Danish painter I don’t know but on one occasion I thought an indoor scene was reminiscent of an Edward Hopper painting. In narrative terms the film is characterised by several significant absences. The father is absent and we learn about him only through the phone calls received by his wife (all of which, I think, we see from behind her) and Edward’s impressions of a rather gruff huntin’ and shootin’ man. The other missing character is Chloe, Edward’s girlfriend who is talked about but not seen. Visually, a symbolic absence is a framed print in the sitting-room which the family have taken down because they can’t stand it. Apart from the paintings of both the mother and her teacher, there is also an absence of any other cultural artefacts. No TV or radio, no music players, no newspapers, nothing really to intrude upon the introspective and stifling atmosphere. Cynthia owns up to have borrowed a book from her mother – but she confesses that she has hardly read any of it. It’s that use of the term ‘wet’ that is interesting. What does it actually mean? When Margaret Thatcher was savaging her way through the structure of British society, any of the (male) MPs in her own party who complained that she was going too far were dismissed as ‘wet’. The upper middle classes send their male children to boarding school, partly I think, to ‘toughen’ them up – to give them the confidence and arrogance to rule over the rest of us plebs. It clearly hasn’t worked for Edward who instead is sensitive but emotionally stunted. One of the teases of the film is that you hope that he will find some sort of emotional release with Rose – but this is a film in which narrative expectations are not likely to be fulfilled. It seems that Joanna Hogg expects her audience to decode all the signs of repression in this family and to take their pleasure from the presentation of a well-crafted art object, but I can’t help wondering what her underlying motive is. Does she intend a political critique of this kind of upper middle class life? Perhaps the problem is mine in expecting some kind of social commentary to be progressive in some way? One specific point in respect: I found some aspects of Edward’s description of the project in Africa to be unbelievable and I’m not sure whether this was intended. On the other hand, I think Joanna Hogg succeeds in creating an art film which successfully challenges audience expectations in an intelligent and carefully constructed way and I guess that can’t be a bad thing. The 'Madame Butterfly' character awakes in her hotel room. The Malaysian-Taiwanese director Tsai Ming-Liang appeared at the Leeds International Film Festival in November over a couple of days as part of an event organised by Leeds University Centre for World Cinemas and the Taipei Representative Office. On the first day he introduced a screening of his film The Wayward Cloud (2005) and on the next day he took part in a study morning at the university followed by an afternoon screening of his short film Madame Butterfly and a Q & A. Before the screening he was presented with the LIFF’s first Golden Owl Lifetime Achievement Award by the festival’s director Chris Fell. Madame Butterfly is a 36 minute short film produced for the celebration of Puccini’s 150th anniversary in Lucca organised by the ‘Centro Studi Giacomo Puccini’. This French/Italian/Taiwan production was shot, in Malay, in Kuala Lumpur. I need to describe the short, but doing so doesn’t really offer spoilers since ‘narrative resolution’ in the conventional sense isn’t what this film is about. The scenario is very simple – a woman is seen in a Kuala Lumpur Bus Station, attempting to buy a ticket home. But she doesn’t have enough money left after paying a hotel bill that was bigger than she had budgeted for. Although the bus company are willing to accept her offer to pay slightly less, she attempts to phone her boyfriend who she blames for the size of the hotel bill. The whole film is presented in three long takes, shot by Tsai himself on a digital video format (he doesn’t tell us what format, but he implies that the camera was quite large). The first two takes cover the scenes in the bus station, ending with a close-up framing in which the woman finds a hair in the soft bread roll that she is eating. The third shot returns us to the hotel where the woman awoke earlier to find her lover already gone, leaving only a couple of hairs on the pillow. I’m not familiar with the Madame Butterfly story, so I accepted Tsai’s explanation that his interpretation of the story is that it is about a woman waiting for her lover to return after they have parted. I’m not sure what I thought when I watched the film. I was fascinated by the hustle and bustle of Kuala Lumpur’s bus station and this was effectively represented via Tsai’s camera which followed the woman as she moved through the crowds. As far as I could see, the camera was held quite low down which reminded me of the Ozu position of the child’s eye view (although of course Ozu didn’t move the camera to follow his characters in this way). I asked Tsai about this, but he denied that the camerawork was ‘designed’ in any way – he was simply trying to record what happened to the character. In the final scene, however, he told us that he waited with his actress all day in the bedroom, shooting her in bed asleep and waiting until the sun coming into the room provided the lighting that gave the image the mood or tone that he was looking for. Several critics have commented on this shot as depicting the ‘morning light’, but unless Tsai is playing with us, it must be the afternoon light. The notion of a ‘playful’ director who tells us contradictory things about his work is something that accompanies many film ‘artists’. To sit in the wonderful surroundings of The Hyde Park Cinema in Leeds and to watch a short film and hear the director discuss his work is to experience a coherent art event. The audience, which was primarily composed of Chinese students in the stalls where I was sitting, had come to see the artist and were quite happy to listen to him for the best part of 45 mins before the Q & A proper. Tsai sees himself as an artist first rather than a filmmaker working in an industry. He isn’t worried by his relatively limited output. Now in his early 50s, Tsai has been involved in filmmaking for around twenty years in Taiwan and in that time he’s produced some twelve features and five short films or ‘segments’. That actually seems an impressive output to me but he stressed that he only works when he feels ‘creative’. (He also intimated that he felt old – God help the rest of us!). There was surprisingly little discussion of the film as such and, as you might expect, Tsai didn’t wish to ‘explain’ it. It was clearly restricted in terms of budget and it should have used a song but the budget wouldn’t run to it. Thus one actor and the writer/director/camera operator comprised the crew. The sound is mostly ‘direct’. Tsai was keen to promote his own status as an ‘artist’, claiming to be the only Asian film director to make ‘personal’ films and seeing the future as requiring arthouse cinemas to be more like galleries. He is clearly resigned to the death of ‘film as art’ for popular audiences suggesting that “audiences in Europe are changing – and not for the better”. The closure of traditional cinema palaces and the move to multiplexes in shopping malls means that “cinema is just another form of shopping”. 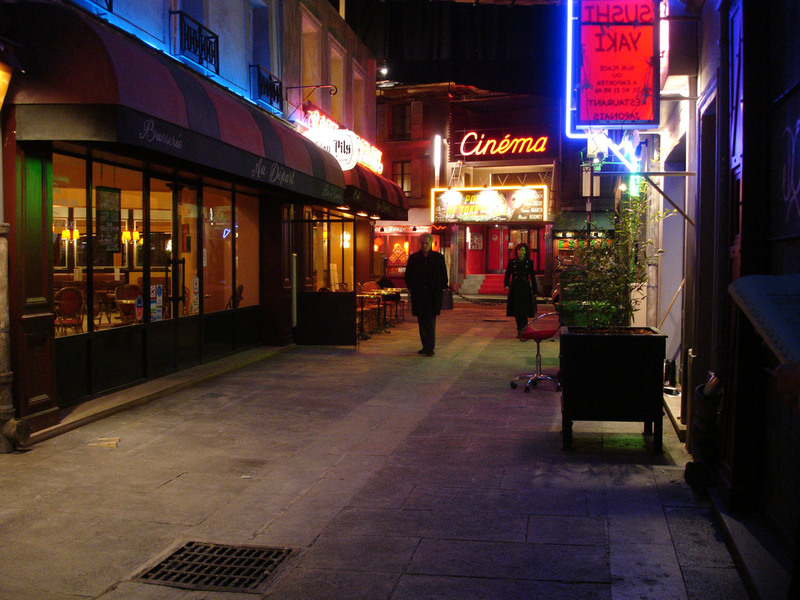 (These ideas form the backdrop to Tsai’s 2003 feature Goodbye Dragon Inn, set in the last Taipei traditional cinema for its final screening – of King Hu’s 1961 classic film, Dragon Inn.) Tsai concluded that alongside galleries, universities were the only hope for future arthouse screenings. “Cinema must become culture”, he said. Perhaps we should get him into discussion with the new Culture Minister? It’s ironic that much as congratulations must go to Leeds University and the LIFF for bringing him over, elsewhere many UK university cinemas/film societies are increasingly showing mainstream films. In the closing section, Tsai responded to the usual questions about influences, filmmakers he admires etc. In a follow-up to my Ozu question, he mentioned that Ann Hui had recently made a film that had the ‘atmosphere’ of Ozu. I think he was referring to The Way We Are (HK 2008). He confirmed his cinephilia by quoting Bazin on Chaplin and associated his decision to wait for the sun through the bedroom window in Madame Butterfly with a book written by “Kurosawa Akira’s assistant” called something like “Wait Until The Cloud Comes” – but I haven’t managed to find this title. I had to dash for a bus so I missed the last few minutes, but it had been an entertaining afternoon and thanks must go to the Centre for World Cinemas and the LIFF and especially to the principal organiser Ming-Yeh Rawnsley who chaired the discussion and acted as translator.